At the end of last year we took a foodie tour of the Levinsky market in Tel Aviv, and one of the highlights for me was the vegan malabi. Malabi is traditionally a dairy dessert, but this one was made with coconut milk and was creamy, sweet and delicious. I promised myself I would attempt to recreate it at home. Well, Shavuot is approaching, and dairy desserts are the order of the day. My mind returned to the delicately scented, smooth malabi pudding, crowned with sweet syrup and pomegranate seeds, and I decided this was the perfect vegan dessert for the festival – all the loveliness of a milky pudding with none of the actual milk! Malabi is very popular in Israel and often pops up on dessert buffets, cafe menus etc. It was apparently introduced to the country by the Ottomans, and shares some features with the Turkish pudding muhallebi whose roots lie in early Persian cuisine. It has the same culinary ancestors as the more familiar (and altogether blander) blancmange, which is also a milky pudding thickened with cornflour. Israeli malabi is flavoured with rosewater and served with a bright pink raspberry or pomegranate syrup. Similar dishes also exist in Cyprus, Greece, and across the Middle East, but are usually served with a rose syrup, and often for breakfast rather than dessert. I find it fascinating how a relatively simple dish can evolve and change as it is adapted by different communities! I used a mixture of coconut and almond milks for my malabi, with just a touch of sugar – I didn’t want the custard to be too sweet as it gets drenched in syrup before eating anyway. The malabi is simple to prepare, and after wondering how I was going to make a pomegranate syrup I had a brainwave – grenadine! I bought Teisseire sirop de grenadine from Sainsbury’s (in the fruit squash section) but there are several other brands listed as kosher by KLBD. Of course, if you’re feeling keen, you can make your own syrup by boiling up pomegranate juice and sugar. Use an equal volume of each, and simmer until you get a syrupy consistency. It should keep in the fridge for a week or two. It probably won’t be as vibrantly pink as grenadine though. I was really pleased how this turned out, and even DH – not a big eater of desserts – said my malabi was “perfect”. I wasn’t sure how Kipper would react to the floral rosewater flavour either, but she loved it too. Although she’s a massive pomegranate fan, so perhaps that’s what swung it. 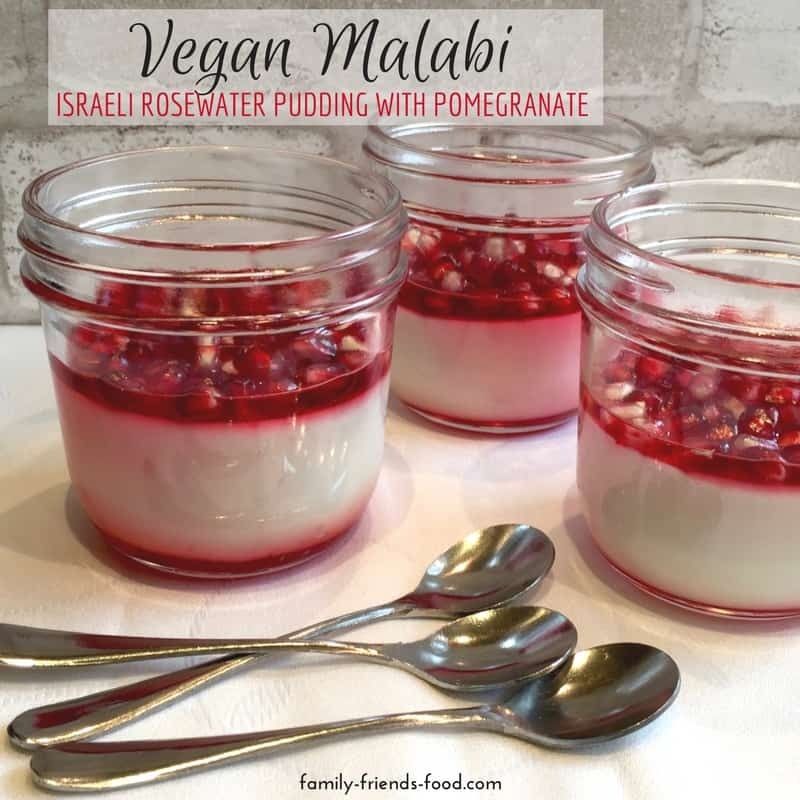 Israeli rosewater pudding with pomegranate. 1 pomegranate - seeds only! Whisk together the sugar, cornflour and 50ml (approx 3 tbsp) of the almond milk in a large jug. Mix in the rose water and set aside. Place the remaining 150ml almond milk and the coconut milk in a saucepan and heat, stirring, until almost boiling. Slowly pour the hot liquid into the cornflour mixture, whisking constantly. Transfer the mixture back into the saucepan and return to the heat. Bring to a simmer, whisking constantly, and cook for 30 seconds to 1 minute until the liquid thickens slightly. Pour into serving dishes and allow to cool before covering with plastic wrap and transferring to the fridge to chill. When ready to serve, pour about a tablespoon of grenadine over each pudding, and top with pomegranate seeds. You can make your own pomegranate syrup by boiling pomegranate juice and sugar, instead of using grenadine. A little shredded coconut on top of the syrup and pomegranate seeds is also a tasty addition. If you need more Shavuot dessert inspiration, why not try my inside-out cheesecake cookies, these delicious mini berry cheesecakes, yummy cheesecake popcorn, or this cheese blintz crepe cake. Or take a look at my Shavuot board on Pinterest for all manner of dairy delights! almond, child-friendly, coconut, easy, family-friendly, fruit, israel, pomegranate, vegan, vegetarian. Bookmark. Depending on the size of your ramekins, and how full you fill them (leave some space for syrup and toppings!) I would estimate 4-6. Hope this helps! I just learned about this dessert and found your recipe. Doesn’t look like I can post a photo, but I made a vegan Pacific NorthWest (US) version with marionberries and blueberries from the garden last summer which I had in the freezer. I love pomegranate seeds, so will have to make it again when I find them next fall. I like your less-sugar version since I’m enjoying mine for breakfast. With the tart berries and no grenadine I poured a smidge of maple syrup and haven’t even waited for them to cool down yet (the arrowroot is a bit slimy at this point, but no matter!) Yum! What a gorgeous looking pudding and one I would definitely include as a dessert option and even better that it can be offered as a vegan choice although I think it’s too good not to share with everyone! I quite agree Laura, especially as lots of non-vegans who tried it couldn’t believe that something so creamy could be dairy free! This sounds absolutely delicious! I adore coconut milk and use it a lot but have only just cottoned on to the fact that it often makes things vegan. I bought some grenadine for a Singapore Sling last week so I’m all set. Thanks Claire. Now I know what to do with the rest of the grenadine! Ooh this looks delicious, the name rolls off the tongue and the pudding has a lovely history. Great video, too!